Tajikistan: Leaders introduced to president-to-be? Unconfirmed speculation is that presidential elections could held as soon as 2019. In a gesture profound in symbolism, Rustam Emomali, the mayor of Tajikistan’s capital and son of the president, last week met with the heads of state visiting Dushanbe to attend a Commonwealth of Independent States summit. In Tajikistan, greeting arriving presidents is typically the purview of the prime minister, making this a noteworthy departure from convention. Thirty-year-old Emomali was captured in photographs as he met in Dushanbe international airport with Russian President Vladimir Putin, Kazakhstan’s Nursultan Nazarbayev, Alexander Lukashenko of Belarus, and others. 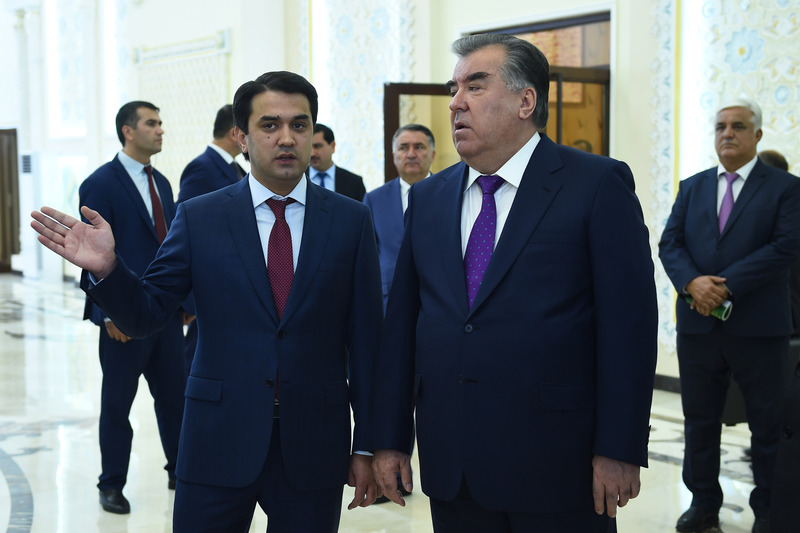 The received wisdom is that this marks an important stage in a widely mooted succession strategy as incumbent leader Emomali Rahmon, who turns 66 on October 5, introduces his son to the leaders of some of Tajikistan’s main international partners. Speculation from Akhbor, an often well-informed news website based in Prague, is that Rahmon may even be bracing to announce the holding of elections in 2019 in mid-November. This announcement could be made after the first two turbines of the all-important and politically existential Roghun hydropower dam are put into operation, the website said. The next presidential election, which takes place every seven years, is in theory scheduled for 2020, but that year is also due to see parliamentary elections. The thinking is that the presidential vote may be brought forward to avoid two major political dates falling in the same year. Akhbor’s reasoning is that Rahmon intends to make the start of operations at Roghun the crowning development of his more than 25 years of rule. The dam, which is slated to cost at least $3.9 billion to complete, has been elevated to the status of a be-all and end-all project — an undertaking to pull the country out struggling indigence. The commissioning of two turbines is only the beginning, however. The end product will, if ever finished, comprise six turbines and produce enough power to generate hundreds of millions in electricity export revenue. Another factor mentioned by rumor-mongers is Rahmon’s supposedly shaky health. But such speculation is a perennial feature of succession forecasters in Central Asia and there is no evidence that Rahmon is indeed ailing in any meaningful fashion. The notion of an imminent transition at the top is supported by the decision to hold a referendum in 2016 that amended the constitution to reduce the minimum age of eligibility for presidential office from 35 to 30 years. At a cursory glance, this appeared tailor-made to allow for Emomali to take the job. He turns 31 in December. Even if Rahmon were to formally surrender his title as head of state, he would retain significant — arguably still paramount — rank by virtue of his lifelong Leader of the Nation status. The president was bestowed with this title by lawmakers in 2015. The bespoke post allows Rahmon to address the nation and state officials on matters of security, as well as domestic and foreign policy. He can also attend government meetings, National Security Council gatherings and parliament sessions. Crucially, Rahmon will enjoy veto authority over all important state decisions.